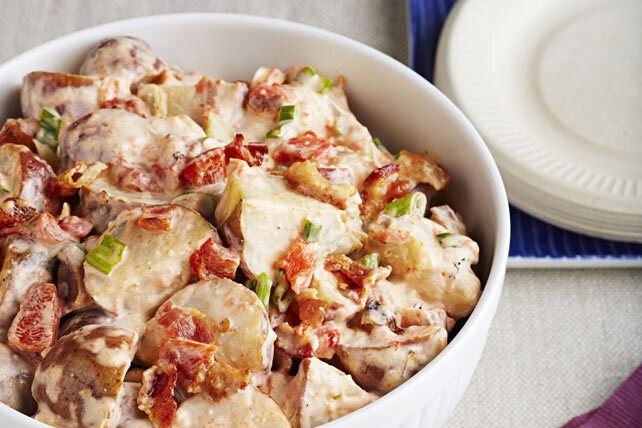 It's a given you'll get the roasted red pepper fans on board with this potato salad. The garlic, crumbled bacon and grated Parmesan will win over the rest. Place potatoes in large bowl. Add water; cover with waxed paper. Microwave on HIGH 15 min. or just until potatoes are tender, stirring after 7 min. Drain; return potatoes to bowl. Cool slightly. Blend mayo, 1 pepper and garlic in blender until smooth. Add to potatoes; mix lightly. Chop remaining pepper. Add to potato mixture along with the remaining ingredients; mix lightly. When boiling potatoes for a potato salad, the potatoes will continue to cook even after you have drained them. As soon as they are tender, drain then spread onto a rimmed baking sheet and refrigerate until cooled. Heat broiler. Place whole peppers on foil-covered baking sheet. Broil, 4 inches from heat, 7 to 10 min. or until evenly blackened, turning occasionally. Place in paper bag; close bag. Let stand 20 min. or until peppers are cooled.